Familiarize yourself with the following entries before watching a video about the traffic in India. Ganesha - is one of the best-known and most widely worshipped deities (gods) in the Hindu pantheon. His image is found throughout India and Nepal. strewth – an exclamation, expressing surprise or disappointment. Generally used to add emphasis. 2. The number of ____________ in India is almost a double of that in the UK. 3. Is the traffic-related death rate in India twice as high as that in the UK? Remark: Please note that some people might consider this expression offensive. What does ‘nerve-jangling’ mean in the above context? 1. An experience which was about to take place would be terrifying. 2. Let me give you some alarming statistics. 3. 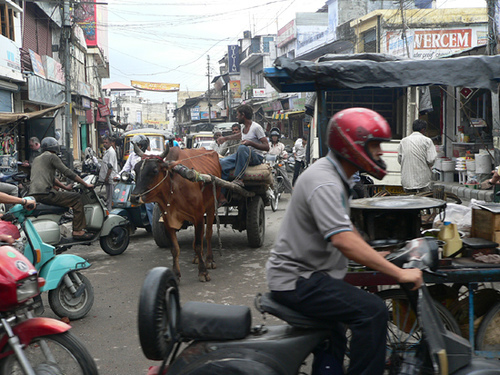 Throughout India there are now 74 Million vehicles, roughly twice what we have in the UK. 4. Because as night fell, our overnight halt was still 80 miles away. 5. That's completely unlit! An unlit wide load. 6. "Your father will be very cross with you when he gets home!" 7. The next morning, the dual-carriageway madness continued.